I heard a minister say on Sunday, "Thankfulness to the Lord in our heart is a salve for our soul." At this particular time in my life, I can relate to salves. At the recommendation of our good friend and physical therapist, I have been applying a capsaicin creme to my neck for some chronic pain issues. The intent of a salve is usually to soothe, to cure or to heal. This minister was telling us that expressing thankfulness in our heart to the Lord would heal and soothe the wounds which the world, the flesh and the devil have inflicted upon us. I found his words to ring true in human form later in the week. I was walking down the halls of the hospital traveling to a place that is almost the farthest spot from my own unit. Since it was very early in the morning, the halls were virtually empty, leaving me alone with my own thoughts, and I was nurturing them with every step. I was pondering a particular issue in my life which was tempting me to feel discouraged and frustrated. The more I nurtured those thoughts, the more discouraged I felt. When I had just about dug myself into the deepest little hole I could, I rounded the corner and bumped into Larry. Anyone who works in my hospital immediately has the image of a sweet, smiling gentleman who speaks to absolutely everyone, who is kind and thoughtful and spreads goodwill and cheer everywhere he goes. Larry and I walked along for awhile and his happy, cheerful attitude flowed over me like warm sunshine on a summer day. On my long walk back, I thought about Larry. I know sometimes Larry must get frustrated with aspects of his job -- but you would never know it. I know sometimes Larry must feel bad physically or be tired --but you would never guess that was the case. I know sometimes Larry must feel sad -- but I have never seen his face to show anything but genuine cheerfulness and joy. Larry lets the treasure on the inside show through no matter what is happening to his "earthen vessel". Then I wondered, which would I rather encounter in the hallway. . .me as I was before I ran into Larry, or Larry? No matter what the situation, no matter what the feelings or the temptations, our Lord is not asleep. He has not forgotten us and we are not alone. We can "give thanks" in every situation of our lives "for this is the will of God in Christ Jesus concerning you". When we do so, that salve of thanksgiving will not only bless us, it will flow from us and like my friend Larry, it will bless all with whom we come in contact. Every Friday until our vacation, we will post items concerning our upcoming vacation. I am beginning to plan what has to be packed for our trip. Not the clothes, but all the other "stuff". I am one of those people who ask themselves "what if?" questions while preparing for a trip. "What if one of us becomes ill? Do I have the right medication?" "What if one of us hurts themselves? Do I have first aid supplies?" "What if we need to charge our computers or cell phones while on the road? Do I have a power inverter?" "What if we want to take coffee and snacks?" Do I have the thermos, cooler and a bag ready?" You see how it goes. Basically I am a boy-scout in a woman's body. Always be prepared is my attitude. So I am making those lists (we've already talked about that haven't we?) so I can check everything off as it is packed up and loaded in the car. I have to not only anticipate what might be needed or wanted, but I also have to know the people with whom I am traveling. What my older daughter may need or want may not be the same as what my youngest daughter may need or what and that surely isn't the same as what my husband would need and want. My goal is to always be able to reach into a suitcase or bag and pull out the thing they need when they need it. Before they would even know they had the need, the supply would have been packed away in the suitcase waiting to be used. Our Lord is that way. He is prevenient. His supply is there before the need. We don't always see that because we don't always seek Him as our supply. (Just like my family may not ask me if I have the item that may be tucked inside the suitcase.) But if the need is in our life, in some way, shape or form, the Lord has already provided Himself the supply for that need. He is always the answer. Sometimes it may look like money or provisions or strength or peace or comfort is the answer, but behind the appearance, He is always the answer. "And it shall come to pass, that before they call, I will answer; and while they are yet speaking, I will hear. " Vacation, The Journey and the Destination -- 51 Days to Go. It is exciting to contemplate traveling to a city --or in our case, cities-- to which you have never been. But in this age of information and internet, you can virtually travel everywhere before you even arrive. We are at the point in planning our trip where we are deciding exactly where we want to go and what we want to see when we get there. In one city we are going on a whale watching tour. In another, we will do a walking tour of different food establishments in a particular part of the city. All four of us cook, and we all love to eat good food, so this should be especially enjoyable to us. We have been on the website of various notable restaurants choosing which ones we will like to visit, based on their menus. We have looked at different landmarks trying to decide which ones we would like to visit the most. We know we will be going to one Major League baseball game during our trip. And we have tried to leave time for just "looking around" the cities. We have talked to friends and family who have visited these cities and have tried to glean from them their advice and wisdom. 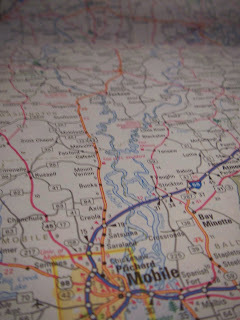 It's exciting to know that in 58 days we will be on the road, headed for these places we have anticipated for so long. In a way, it reminds me of our sojourn here as Christians. We learn about Heaven through the Scriptures and we have glimpses of what it will be like, but we can't know for sure until we get there. The one thing we do know is that it will be complete pleasure and comfort and peace and joy because the One who is Peace and Joy will be at the heart and center of it all. We will look back at our lives here as simply preparation and the journey to get there. And we won't have to pack anything! Every Friday until our vacation, we will post items concerning our upcoming vacation. This is the first of those posts. I confess, I am a list maker. I have even been known to make lists of lists. I am one of those people who find joy in marking things off a list. There is just a certain sense of accomplishment to me, not so much in the doing of the item, but in the marking it off the list. So in planning our vacation, I have lists and lists. Actually, I have a whole section of software dedicated to planning our vacation. Let me say here, if you have never used the software One Note, it is wonderful for planning or organizing events, research, studies or even just your weekly menus. I recommend it highly for anyone who loves using the computer and loves organizing their data. Commercial over, now back to the vacation. A trip of 23 hours, 21 minutes by car, traveling 1446.32 miles needs more than just casual planning. I have for weeks been reading reviews for various hotels in the two major cities we will visit. I have tapped in our arrival and destination dates so many times I am almost sick of seeing them. I have compared multiple sites, multiple times. I now know Expedia, Orbitz, Hotwire, Priceline, Kayak - a personal favorite just because of the name, and Hotel.com intimately. Finally, we have hotel reservations. The relief is almost as big as the bill. With four of us in this party and I feel pressed to make it as pleasurable and comfortable for everyone involved. I have wanted to make sure our accommodations offered us everything that each of us want or need. I don't have to feel that the plans are all mine, there is Wisdom to be had and Guidance to be sought. I am just as confident that the One who has a plan for my very footsteps has plans to reveal Himself to us along each of the 1446 miles in ways we could never imagine beforehand. As much as I am excited about seeing these cities for the first time, and sharing them with my husband and daughters, I am excited about what I know the Lord will reveal to me about Himself along the way. No journey is wasted for those who want to see. I look forward to the journey and to sharing it with all of you. floor. Finding a 2mm white pearl earring on a 2inch square white tile floor isn't easily. Especially if you haven't put your contacts in yet. I looked across the floor for the earring and saw no sign of it. Normally, losing an earring wouldn't bother me because I have learned over the years to not invest in expensive earrings. My father used to give me nice earrings for Christmas each year. It wouldn't take long before one, if not both, of the earrings would be lost. Once my dog even ate one of them! Finally I had to tell him to stick to the imitation variety. So none of my earrings have any value, except this pair. These pearl earrings, while actually pearls, probably don't have much monetary value, but they have great sentimental value for me. My father gave them to my mother and they are very dear to me. I knew I had to find that little earring. My vantage point of standing in the bathroom allowed me to see a great deal. I could see myself in the mirror, I could see the pencil drawing of a mother and child which Glen brought me years ago. I could see the black and white photo of myself and my siblings taken when I was just a tot. But I could not see the earring. Looking down on the floor was not sufficient. I had to get down on my knees. No, not just my knees, on my hands and knees, to find that earring. I looked all around and finally saw the shine and luster of the tiny pearl. As I picked it up, still on my knees, the spiritual truth came home to me. We cannot find the Pearl of Great Price while standing up. When in a position to center our thoughts and actions on ourselves, we will never center ourselves on another. Pride in our heart can keep us from fully knowing the Lord. It is only on our knees that we come to see what the world may view as insignificant and small, but we know to be of greater value than everything else. of how all we who know the Lord were the "temples of the Living God." The Scriptures clearly present this truth, but as he spoke, I remembered the large round stained glass window in back of the church in which I was married. When the church was dark, you couldn't see what the window depicted. You could tell it was meant to be a picture, to tell a story, to portray a meaning of something. But the darkness hid the significance of it's careful planning, creation and installation. When the church was full, however, the lights illuminated the window and from the outside the brilliant and deep hues were easily seen. The window depicted the Lord Jesus standing at the door and knocking. If the Lord Jesus has "come in" unto us and dwells within us, then He is the Light of our temple. " That was the true Light, which lighteth every man that cometh into the world." (John 1:9) He will illuminate us from the inside and the story which our life was planned, created and purposed to portray will show forth on the outside to all who see us. Those who do not know the Lord Jesus, those who have not opened that door and let Him come in, will remain in darkened temples. They may try various candles of the world to light their dwelling, but the cold and feeble flames will always self-extinguish and yield a poor and meager attempt at illumination. Only the glory of God, only the Light of the world can flood our hearts and souls with Light and Truth. There is but One Light of the world, One Door, One Way. He is standing there knocking still, His heart full of grace and mercy and love for us. As the old hymn asks, "Oh, why don't you let Him come in?" You'll find His arms open wide. O how He wants to come in." the truck is slowly churning, the red stripes circling round and round. I visualize the cement and rocks being stirred and tumbled inside. I know this constant tumbling is necessary to keep the soft concrete from setting up and turning to one solid hard mass. 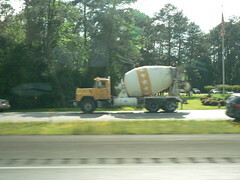 Watching the cement truck, I think of how Christians need the same constant tumbling and churning from fellow Christians. We need to be stirred, to have our thoughts and beliefs tumbled around the heads and hearts and minds of other Believers. We need our thoughts to fall around on the rocks of others so that any hard spots can be broken up, so that we don't become hard or set in ways that are not conformed to the image of our Lord. When a Believer begins to fall away from the Lord and separates themselves from the fellowship of other Christians, some sort of hardness begins to set up in their heart. Or some sort of wrong thought or doctrine takes form that would have otherwise been broken up by the fellowship and guidance of other believers, had they continued in "assembling together" with other Christians. We are to be guided in this Christian life by the indwelling Holy Spirit, the written Word of God and the fellowship of other believers. Together these things will act as our "cement truck" keeping us soft and pliable, ready to be used, ready to be conformed to the image of His dear Son. Rom 8:29 " For whom He did foreknow, He also did predestinate to be conformed to the image of His Son, that He might be the firstborn among many brethren." Noah is home. Really home. What a combination of feelings we all felt last night at the airport! In true Recon fashion, just as they left quietly without fanfare or ado, they returned quietly without ceremony or pomp. We stood facing the gates, our eyes glued to any moving figure -- "Is it him?" -- we almost seemed like little kids with their faces pressed against the glass trying to see Santa. We had no less anticipation than those kids either. Aimee talked about how fast her heart was beating and I realized mine was racing, too. I almost felt afraid to breathe lest I miss that first glimpse. Everyone waiting at the window remarked at how disappointed we must look to everyone who passed by who wasn't Noah. Then I saw him. My thoughts then were the same as the first time I ever saw his face, not even fully born yet, I thought "He looks like my brother Chester!" Then when he looked at Aimee, the smile on his face was priceless. In that moment I wished I had broken my promise to him and brought the video camera anyway. As we were waiting for him to walk through the security gate, Marie commented that she had been the first to cry and Emmie emphatically stated that she did not and was not going to cry. Just at that point, Noah came through the gate and Aimee and Noah fell into each other's arms. Emmie, with tears on her cheeks, said softly, "OK, now I'm gonna cry." That night, sitting in the living room, listening to Noah tell stories and watching everyone around him laugh and have their attention riveted to him (as if he might be swept away again if we didn't), reminded me of the younger Noah telling stories. What a sweet thing for a mother to be able to kiss all her children goodnight and to sleep the peaceful sleep of one who has seen with her own eyes that all is well. The main thing I learned listening to Noah's stories was exactly how much our prayers were answered. For all the incidences we heard about we know there are thousands more that we will never know. The one thing it makes me want to do is to thank the Lord over and over for His unspeakable faithfulness. "If Something Happens To Me. . ."
He went on to detail some very practical things that he thought were important for me to know and to do if that "something" should occur. We had a good conversation about the details, but all the while, deep inside of me, was a person screaming out, "Please don't leave me alone!" All of us have had and faced at some point that temptation to fear being abandoned by someone. We may fear a spouse dying, or something terrible happening to a child. As our parents age, we may fear the day when they are no longer with us. It can be a gripping, disabling fear if we let the thoughts take root in our heart and mind and grow into a mighty tree. As soon as those little roots began sprouting in my own heart, I thought back to the times of loss I have already been through in my life. I remember the day my father died -- something I had dreaded since the day his brother died unexpectedly. I remember only a few months later when my mother died. I only realized recently that when I laid across her bed and wept violently, I was mourning not one, but both parents. I remember a day over twenty years ago when Glen and I were told that there was to be no baby after all. With tear stained cheeks found solace in each other and our grief shared was more easily carried. I even remember when a dearly loved beagle had an accidental death. I spent that night at the side of my daughter's bed, in case she should wake up during the night missing her usual sleeping companion. Grief is one of our deepest emotions. It hurts us and racks our very soul. But it is also the opportunity through which we can know the most sublime comfort from our Lord. In every moment of grief I have known, I have also known His love, His peace, His comfort, and yes, His joy. I have been surrounded by and enveloped in a sense of Him that was unmistakable. The pain was not removed, but He was sufficient in the pain. The tears did not cease to flow, but He was comfort through the tears. I have great confidence that whatever may be in the path before me, that He will continue to be sufficient for every moment. He will be all in all that I need Him to be. There is nothing too great for Him and there is nothing that can separate me from His love. I am safe in Him.